We’re on TV! 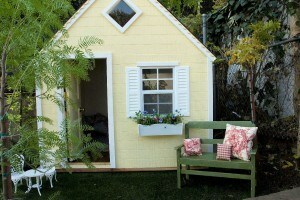 Our Enchanted Cottage playhouse was featured on an episode of HGTV’s “The Outdoor Room With Jamie Durie”. For those of you who don’t normally watch HGTV, “Jamie Durie is one of the most well-renowned and sought-after landscape artists in the world”, according to his home page at the HGTV website. This is a makeover show in which Jamie Durie and his top notch crew transform a family’s problem yard into a beautiful haven they can enjoy to the fullest. These transformations are inspired by Jamie Durie’s travels throughout the world. 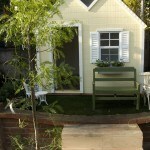 Our playhouse was featured in an episode called “The French Garden” which aired twice on July 30th. They tell me it may air again, but have not supplied a date yet. When we get it I will post it here. The lucky couple, Shingirai and Erlinda, ended up with a beautiful, tranquil French-inspired back yard for their new home in Windsor Hills, California. 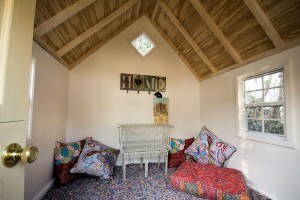 And their super-cute little daughter Rihighna got a fantastic playhouse of her very own. 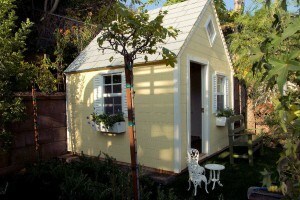 With space at a premium, we assembled our 6′ x 6′ Enchanted Cottage in a comfy little corner of the yard, nestled between some nice shade trees. 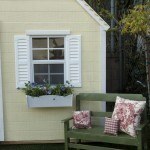 We painted it a tasteful shade of yellow and adorned it with window boxes filled with pink and purple flowers, Rihighna’s favorites. The interior was filled with decorations and furnishings befitting a little princess, and the attractive child-sized bench and chairs placed out front added a nice finishing touch. “An outdoor room is meant to be an escape from everyday life, and with a family, it needs to be an escape for every family member at the same time.